During this week as the build season was coming to a close, PR was busy working on getting some cool videos of our robot for our weekly video and editing it down so it can be published. Work on scholarships continued as PR finished up putting state-specific scholarships on the list. Work on the Dean’s List Essays were finished and submitted. Work on this website continued as well as work on pit posters. A few members of the PR team began work on creating posters for the Midwestern Regional Poster Competition. Finally one of the last things we did this week was start choosing names for our practice and competition robot. 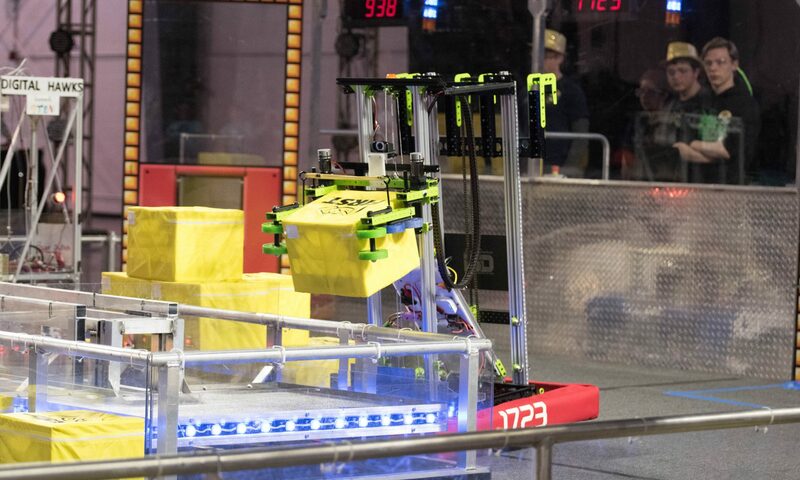 Of course, starting the last full week of build season, the B/D team was busy finished everything they could on the competition robot and field elements so that the robots could be tested. Several small adjustments were made this week in order to get everything to work perfectly such as moving the brush down half an inch and moving the plate for the electronics was moved up one inch. Organization and cleaning continued as always in order to prevent everything from getting out of hand. Bumpers were added to practice bot and support pieces for the front plate. 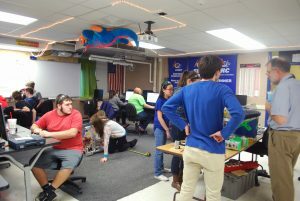 Everyone worked hard to get everything assembled and added to the competition and the practice bots and get everything working properly. Control worked hard this week in order to get the robot to have all the necessary instructions in order to work properly, such as getting the gyro turn to correct and getting it to line up with the gear peg. Work on getting the cameras on the robot to be able to recognize shape and color continued as well as the Bluetooth servers. As the week progressed more work was done to the vision of the robot and having it be able to recognize different things as well as creating the ability to toggle between two cameras as well as getting the robot to be able to drive straight and the gyros to turn right. Work was also done to get everything to work in harmony with each other.